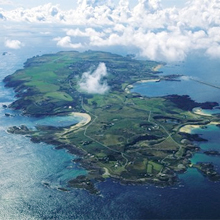 At just over 5 square miles in area, Alderney is incredibly the 3rd largest of the Channel Islands. Also known as Aurigny, the island’s unique essence undoubtedly comes from its isolated geographical position and its long human history dating as far back as the Neolithic age. With just over 2,000 regular inhabitants, the island can really be proud of its assets and of its quiet but firm involvement with the rest of the world. Despite being surrounded by incredibly strong seas and currents, the island’s natural environment is one of peace and beauty. Birdwatchers have made it a favoured destination just as many feathered species have! The lovely puffins, northern gannets and the storm petrels are amongst the few birds that you will be able to come close to while visiting. The Alderney Wildlife Trust works tirelessly to ensure the good management of the eco-system. You can find their office just next to the Tourist Information Centre in Sainte Anne, the main village on the island. Neolithic, Roman and Elizabethan artefacts have been collected over the years by enthusiasts, all tribute to a long history. Harbours, defenses and homes built in succession give the island an incredibly rich heritage. The Alderney Society runs the Alderney Museum a few hours everyday. Do pay it a visit to discover why the island was so heavily fortified in the 19th century and what happened during the Second World War. Having defended itself successfully against France for centuries, Alderney fell in the hands of the Germans in 1940 and became the last of the Channel Islands to be liberated, a week after Jersey. Every Channel Island is rightly proud of its restaurant scene and Alderney is no exception. The abundance of fresh supplies from fish to vegetables combined with the local chefs’ imaginations gives us a wide choice of restaurants, menus and foodie pleasures not to be missed. We would strongly recommend Braye Beach Hotel for a culinary experience as well as for its exceptional location on one of Alderney’s sandy beaches. What a treat! A quarter of the hedgehog population on Alderney is blonde! This entry was posted in Alderney. Bookmark the permalink.